Whilst browsing York Coffee Emporium’s website looking for my next caffeine fix I noticed that they they sell Cuban coffee beans – this caught my eye as not many people import and roast them. 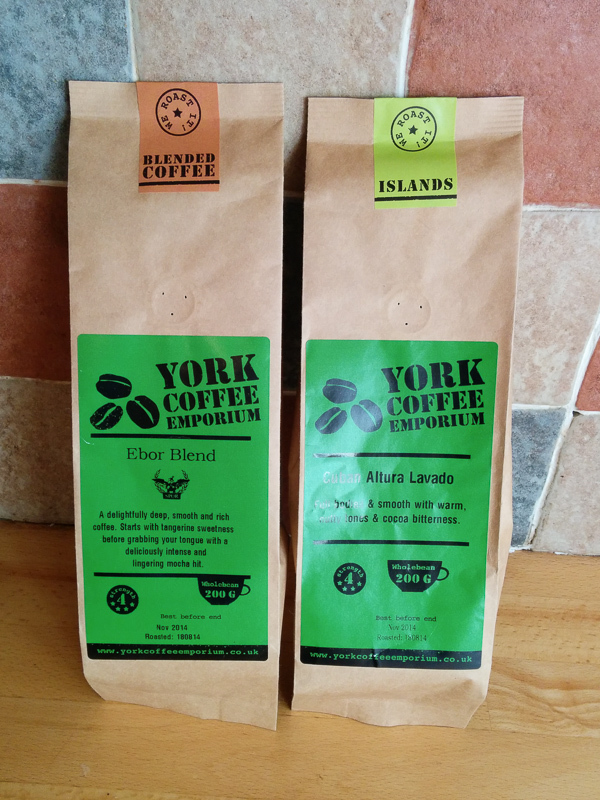 I caught up with York Coffee Emporium at the Malton Food Lovers Festival and had a great time at their stall talking all things coffee. I had a chance to try some of their different blends, but unfortunately they didn’t have any of the Cuban beans with them so I wasn’t able to taste them. 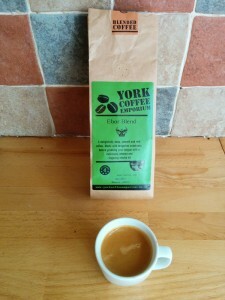 A few months later I was approached by York Coffee Emporium and asked if I would be interested in reviewing some of their coffees. I saw this as a great opportunity to try their Cuban beans that I had been looking at on their website. My normal “everyday” coffee is a blend so thought I would also try one of their blends. 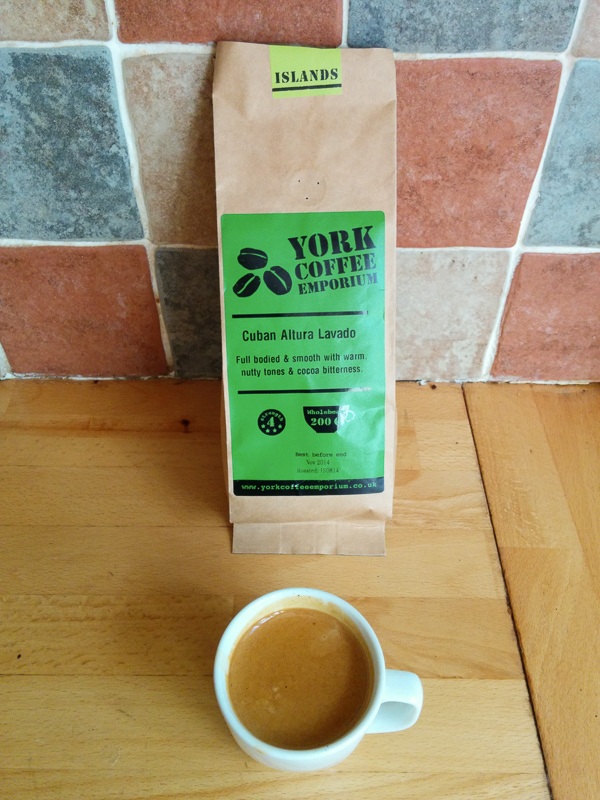 The first coffee to be brewed was the limited edition Cuban Altura Lavado.When looking at the beans, they are dark and glossy in colour with a great aroma. The shots pulled from the espresso machine produced a lovely thick crema. When used in an Americano they produce a rich, smooth, full bodied coffee with a nutty, woody earthy taste. When used in a Latte, the taste punches through the milk and produces a strong bold flavour. 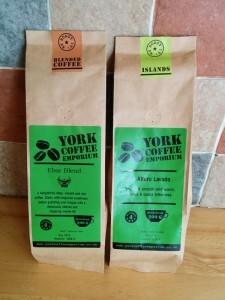 The next beans to be brewed were the Ebor Blend. This blend is made from 3 different coffees – Guatemala Huehuetenango SHB, Malawi Pamwamba and Papua New Guinea beans. These beans are lighter in colour and have more of a matt appearance. As with the Cuban beans, they created a lovely thick crema. In the Americano they produce a slightly sharper citrusy taste with more complex flavours which linger on the palette. In a Latte, the flavours are a little more subdued which produces a smoother, easy drinking taste. I would definitely recommend either of these two coffees. As the Cuban beans have a stronger more robust flavour they would be well suited to true coffee lovers. Personally I really enjoyed them as an afternoon pick me up. The Ebor Blend is much smoother to drink but is still packed with flavour. I could drink this Blend all day long! This entry was posted on Sunday, September 21st, 2014 at 5:11 pmand is filed under . You can follow any responses to this entry through the RSS 2.0 feed. You can skip to the end and leave a response. Pinging is currently not allowed.